Los Angeles is one big laboratory for the dance-floor sounds of the future. We join German star DJ Moguai on a nocturnal expedition to the coolest clubs in the city. The heavy iron door on Melrose Avenue opens as if by magic. Muffled beats pound through the night. A sign in the courtyard promises “Paradise” while cushioned seating outside a white bungalow evokes a lounge-like atmosphere. This studio complex is a hot address in Los Angeles. It belongs to Fernando Garibay, a music producer with Mexican roots whose clients include Kylie Minogue, Shakira, and U2. He also produced the album Born This Way with Lady Gaga. A creator of both electronic tracks and international chart hits, his work has been nominated for numerous Grammys. Sitting at the mixer in the rear of the studio is Moguai. His real name is André Tegeler, and he comes from the German city of Marl in the Ruhr District. At one time he was the youngest journeyman butcher in Germany’s most densely populated state, North Rhine-Westphalia. Since the mid-1990s he has been traveling the world as a DJ. And now he’s a star. His “Punx” sound is sought after the world over, and he takes part in all the major electro festivals around the globe. His productions for the Sugababes, Girls Aloud, and 2raumwohnung have gone gold and double platinum. In 2014 he received the “Song of the Year” award for his club productions from the largest online music store. In his mid-40s, Moguai is already an old hand in the music business. He captured the imagination of the City of Angels the first time he played the Monday Social at the Playhouse on Hollywood Boulevard. It wasn’t love at first sight, but after dozens of shows and regular releases under house DJ deadmau5’s label, he decided to move from Germany to the US in 2015. Since then he has lived in Santa Monica with his wife, actress Birte Glang. The L. A. music scene is a hub of creativity and innovation. “The city’s long-time musical tradition is going through all kinds of new developments,” Moguai says. The beaches of Venice and Malibu, the purple-hued sunrises, and the booming crossover cuisine are all added bonuses. Since the surfer hymns of the early 1960s, the city known as the entertainment capital of the world has been the musical counterpart of New York City. It’s home to the Beach Boys, the Doors, the Eagles, Dead Kennedys, Guns N’ Roses, and the gangsta rappers of N.W.A.—a limitless supply of musical icons. Current examples include Lana Del Rey and rockers like 30 Seconds to Mars. They’ve all earned an enduring place on the map of pop, while the legendary venues in the melting pot of L. A. have turned the city itself into a star. Music has a long history on Sunset Boulevard, which winds through the hills of Hollywood as the Sunset Strip. Led Zeppelin celebrated their infamous parties at the Hyatt House, which was also where the Rolling Stones’ Keith Richards hurled a television set from the balcony. The former “riot house” has now morphed into the chic Andaz West Hollywood hotel, with a photo exhibition of its wild days currently on display on the way up to its rooftop terrace. Other hallowed sites from various pop eras are still found on the Strip. The Whisky a Go Go rock club, where go-go dancing originated, is now home to underground bands. The Viper Room is a scandal-plagued legend associated with the grunge era and former co-owner Johnny Depp. A rock and roll mystique is part of the very fabric of Los Angeles, even though 2018 now largely moves to the sound of digital beats. And that’s also why he’s a Porsche enthusiast. As a nine-year-old, he admired the neighbor’s 911; by 2002 he had purchased one for himself. 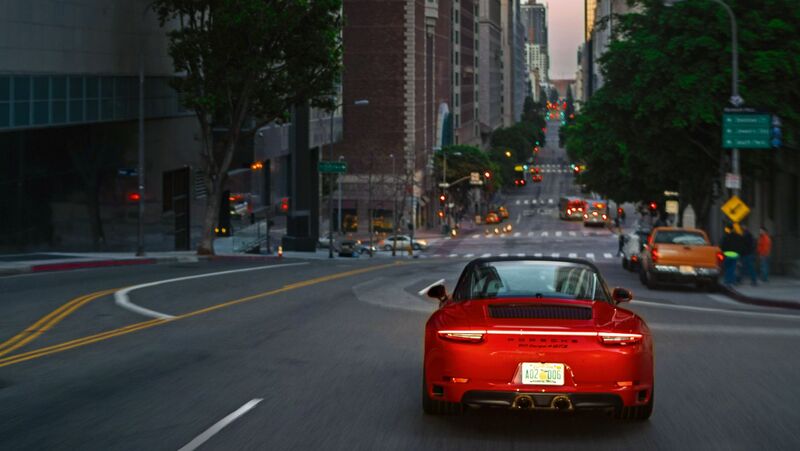 The 911 Targa 4 GTS glides from the skate park in Venice Beach to the heart of the city, Downtown Los Angeles. The art deco neighborhood through which film noir heroes once prowled is now a study in contrasts. Just a few blocks separate the glass towers of the Financial District from the haunts of the homeless in Skid Row. Hard contrasts also mark the city’s new sounds. The grim tones of what the club scene calls bass music have been popularized and given polyphonic break-beat rhythms by Skrillex, a leading electronic artist. Clubs and events like 1 Oak and Low End Theory as well as A Club Called Rhonda stand for a new age of diversity. It’s still early in the evening but crowds have already gathered on Spring Street in front of Exchange LA, which, true to its name, once housed the city’s stock exchange. “I made my debut there in 2016,” says Moguai. Hard fusion sounds also fill this magnificent space and electrify its dancers. High heels, punk T-shirts, Mexican wrestling masks—there’s no particular dress code. But everyone and everything are constantly in motion. Motion is the defining feature of L. A. in general. The clubs are spread throughout this sprawling city. Mexican food trucks are parked next to gas stations, where kids from the barrios fuel up for the night. Bass tones boom from loudspeakers in the cars. Decay is just another name for a breakthrough waiting to happen. The once neglected industrial region of East L. A. has rapidly developed into the Arts District, full of galleries and start-ups. “Faster, faster!” might well be the motto, with electronic music serving as the transmission belt for this progression. “The city challenges you. 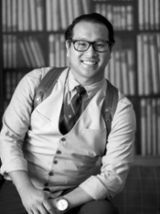 You have to be ready to let new experiences replace entrenched ideas,” says Moguai, stopping at a branch of the In-N-Out Burger fast-food chain. Bible verses are printed on the underside of its cups, following the wishes of the family that owns the company. Irreverent Los Angeles. Constantly redefining its pop stars. As if to prove his point, the Avalon DJs disappear into a gigantic light show. Technology sets the tone here, as does music with hard breaks. When the last break-beat track ends right at three in the morning and Avalon empties at a startling pace, the cars on the lot begin to carry the party out into the night. André Tegeler, alias Moguai, is one of the most successful German DJs in the club scene worldwide. He launched his mix of techno, house, and big beat in the Ruhr District in the early 1990s, founding Punx Studios together with Phil Fuldner. He now travels regularly around the globe, remixing and producing songs for different bands and musicians. He also releases his own tracks under the U.S. label mau5trap. A fantasy hacienda on the outside, a multilevel theater on the inside. Showtime and musical greats have been appearing here since 1927. Along with indie and alternative bands, Avalon regularly hosts celebrated techno and EDM events. One of California’s most famous electronic clubs is located in what used to be the Los Angeles Stock Exchange, with the dance floor on the trading floor. Built in 1929 and now a Historic-Cultural Monument, it features split-levels and a high dome and can accommodate 1,500 techno fans. It’s one of the leading sites in the US for the ever-expanding electronic dance music (EDM) scene and hosts regular appearances by international DJs and acts. In L.A. Maria Sharapova presents the new 718 Boxster GTS – the winner’s prize at PTGP 2018.